Are you using Morningstar Mutual Funds in the Library? We recently were notified that Morningstar has decided to retire the print version of Morningstar Mutual Funds on December 24th but you can still access Morningstar Mutual funds in Morningstar Investment Research Center online using the Virtual Library. We do have limited licenses to the product, so if you cannot get in, wait 15-30 minutes and chances are a license will free up so you can get use it. I will be monitoring the turn-a-ways and if it’s happening too often we will add additional licenses. If you have never used Morningstar Investment Research Center checkout the Help & Education tab. Here you will find how-to guides to print and monthly online workshops on how-to use Morningstar Investment Research Center . There are many new and exciting changes coming to Morningstar Investment Research Center this month! First, you will notice recently improved pages for viewing exchange-traded funds (ETFs). Overall, you will see that the pages include larger, easier-to-read fonts and graphs with additional data points and a more user-friendly interface. The new ETF Quote pages provide a comprehensive overview of the ETF you are viewing, complete with interactive graphs, important price data, style map, sector information, and several other highlights. Just like our stock and fund pages, there is now a Chart tab where users can compare one ETF to another fund or benchmark. And similar to the mutual funds, you can find related fund family data by clicking the link at the top right of each page. They have also updated the Portfolio X-Ray Tool to help investors better understand the types of sectors they are invested in. Now, in the Stock Sector section of the tool, users will see industry sectors, such as health care and technology, divided into three new categories: cyclical, sensitive, and defensive. These three divisions indicate how sensitive the industries are to macroeconomic factors. Investors can clearly see how their portfolio is divided amongst these three broader categories and the 11 industry sectors. Starting in mid-August, you will notice a new area on the Morningstar Investment Research Center. For the first time, they are offering detailed data on closed-end funds (CEFs). The CEF pages have the same look and feel as the other fund analyses, while allowing investors to learn about a whole new segment of funds. To learn more about CEFs, check out the CEF summary in the Glossary and Methodologies section of the Help & Education tab. Target-date funds have been in the news quite a bit lately. These funds are designed to become more conservative as their “target dates” mature, and have been positioned as good investments for those who know at what point they’ll need to tap these assets–such as retirement or for college. They are even the default options in many 401(k) plans. If you go to the Markets tab, you will not only find industry and sector breakdowns, but also fund category breakdowns. To do this from the Markets page, choose “Fund Category Returns” under the Styles heading. You can also gain access to “Fund Categories” straight from the home page in the Markets section. Once there, you will find a list of target-date funds under the Balanced Funds category. Click on the category that fits your retirement date to see a list of those funds. The other way to find these funds is using the Fund Screener. As I noted above, target-date funds are actually in the Balanced Funds category. So from the drop-down menu on the screening page, you will want to select “Fund Category” and set the condition to Balanced. After making that selection, you will see another menu on the screen which will have a list of all types of balanced funds, which includes target-date funds. Pick the range you are looking for, and you will see the number of funds that pass your screen. Click the button on the right to view results. 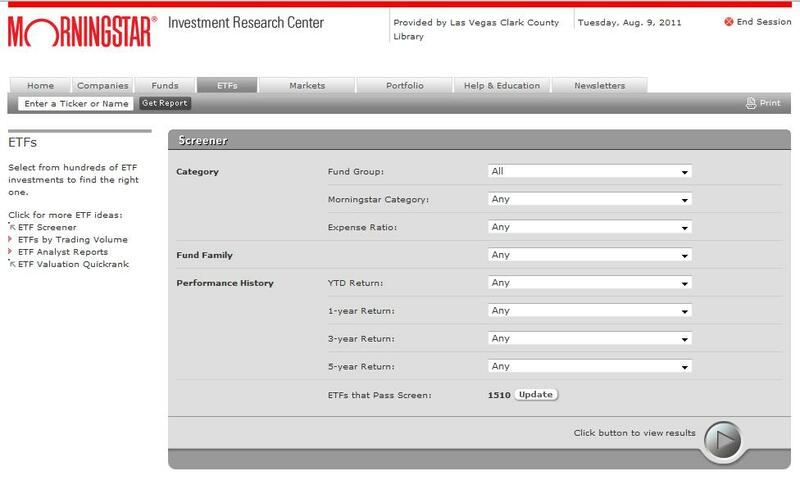 On the results page you will find Morningstar Ratings, returns, total assets, and more. Use the “View” drop-down menu to view performance, risk and tax information, and portfolio metrics. For more information on a particular fund, simply click on the name to get the fund’s data and analyst reports. Morningstar Investment Research Center has published their annual investing guide for 2011. The guide features insights from their top equities strategists with The 10 Best Companies in the World. This report includes information and analysis on great companies with competitive advantages that make for attractive stock holdings. There is also an insightful mutual fund report, The Best Funds for 2011, a compilation of high-quality, reasonably priced funds. The complete guide can be found on the Help & Education page of Morningstar Investment Research Center under the Investment Topics heading. The end of the year brings with it many activities—holiday shopping, gatherings with family and friends, and planning for the year ahead. Part of that planning should involve the not-insignificant matter of getting one’s financial house in order. From evaluating a portfolio, to choosing a 529 college savings plan, to looking for ways to reduce taxes, the LVCCLD – Virtual Library can help. For instance, Morningstar Investment Research Center, an online database in our collection designed specifically for individual investors, includes research on more than 35,000 stocks, mutual funds, and exchange-traded funds. The database also allows you to build and test a portfolio and take interactive workshops and classes to sharpen your investing skills. Morningstar Investment Research Center, is just one example of how the Virtual Library`s databases can help you secure your future. Stop by the Virtual Library anytime, we are open 24/7 and get on the road to financial security. You will need a valid LVCCLD library card and PIN to gain access to the most current stock and fund information from home or office.